Release Date: February 22nd, 2006 (IFC Center) by Marshall Curry Productions. BASIC PREMISE: A documentary about 2002 Newark, NJ mayoral campaign between Cory Booker and Sharpe James. ENTERTAINMENT VALUE: In Street Fight , 32 year-old Cory Booker takes his political battle against Sharpe James to the streets rather than using the media like in normal campaigns. 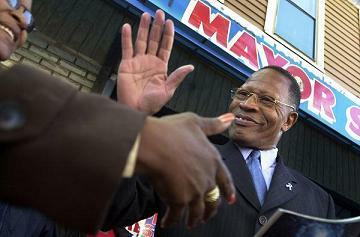 Director Marshall Curry follows their campaigns as if it were a war with James as the enemy. James, who has been mayor of Newark for 16 years, does everything in his power to create obstacles for Booker and find any small detail to humiliate him. When Booker visits an apartment building to promote his campaign, the police show up to kick him out. Later on, James calls Booker white and Jewish, among other lies. When one of Booker’s campaign assistants visits a strip-club, he makes Booker look just as perverted and corrupt. In a funny twist, James himself admits to attending the strip-club merely to make sure that it closes—his biggest lie ever. At times, Curry is unafraid to let you know how difficult it can be for a documentary filmmaker to gain access to certain footage—i.e., when a plainclothes police officer refuses him to film the mayor’s speech. Eventually, the battle between the two candidates becomes redundant and unsurprising. It would have been more refreshing to get to know Booker and James more rather than just watch their political war. A brief scene with photos from Booker’s personal life doesn’t help. Ultimately, it’s difficult for you to truly care about who will win the election. SPIRITUAL VALUE: It’s not surprising how dirty politics can be, even when two so-called “grown-ups” battle for office. James comes across as corrupt, immature, and arrogant. 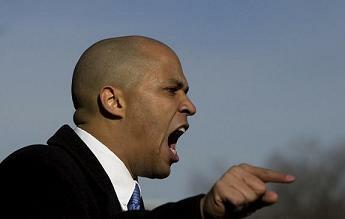 Booker seems not much different than him, although he’s less corrupt and slightly more mature in his methods. It would have been much more thought-provoking if there were more interviews with Newark residents to explore the way they view the campaign. As a documentary filmmaker, Curry should have stepped back and asked, what makes Booker such a big deal in the first place?—and answer it, too. Booker shows very little warmth or charisma onscreen—although he does smile a lot, which hints that, politics is mostly about giving a performance to make you look better while making the other candidate worse at all costs. After the elections, can’t they at least shake hands like grown-ups who show some good sportsmanship? INSULT TO YOUR INTELLIGENCE: Not enough interviews with Booker and James and not enough insight. IN A NUTSHELL: Compelling as a war between two political candidates, but it’s not powerful or deep enough considering its nomination for Best Documentary Feature in the upcoming Academy Awards.